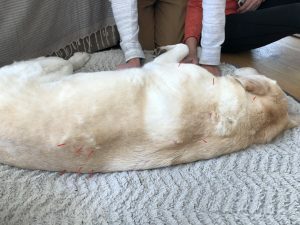 Ellie is a 13-year-old spayed female yellow Labrador Retriever who was referred for acupuncture to treat severe acute-on-chronic neck pain by her regular veterinarian. She had been treated with steroids, methocarbamol, and opioids with limited success controlling her pain. I treated her with a combination of dry needle acupuncture, electroacupuncture, and cold laser therapy. After five sessions Ellie’s mobility, pain, and cervical range of motion improved and her acute lameness resolved. The clients have had Ellie since she was 8 weeks old. Ellie had a right, then left, tibial plateau leveling osteotomy (TPLO) surgery 12 and 10 years ago, respectively. Since then she has had a few episodes of neck pain over the past 3 years which responded to oral steroid and opioid therapy. She has been otherwise healthy and active her entire life. Ellie eats “mature dog food” and is taking a glucosamine supplement daily. Ellie presented to her regular veterinarian 10 days prior to my examination crying in pain, unable to ambulate well, and frequently licking her lips. She was diagnosed with neck pain. No imaging was performed. Ellie received an unspecified steroid injection, buprenorphine injection, and was sent home on oral Medrol and methocarbamol. Doses and frequency were not available. I examined Ellie on October 22, 2018. On presentation, Ellie could walk slowly with her head carried level. Her stride cadence was faster in the thoracic limbs than pelvic limbs. She had a right forelimb lameness. Her neck posture was stiff and she would frequently lay on her right side. She also chattered her teeth and jaw periodically, licking her lips. Unfortunately, Ellie slept through most of her exam which took place in her home. Left lateral cervical flexion was decreased but present. Ellie resisted right lateral, dorsal, and ventral cervical flexion. She exhibited a mild to moderate varus stance in her thoracic limbs with mild digital flexor tendon and ligamentous laxity (breakdown). She had mild decreased range of motion in both carpi and elbows. There was significant myofascial tension and trigger points in the omotransversarius, sternocephalicus, and brachiocephalicus muscle groups bilaterally. Ellie also exhibited significant myofascial trigger points and tension in the caudal thoracic and thoracolumbar regions. She had moderate atrophy of her hamstring muscle groups and significant thickening of her stifle joints bilaterally. She had mild to moderate pain with palpation of the pes anserine bilaterally. Ellie’s neurologic examination was difficult due to her sleepy state. Her pelvic limb reflexes were normal and she did not exhibit a crossed extensor reflex. She had a subtle crossed extensor reflex in the thoracic limbs but her remaining reflexes were normal. The cranial nerve exam was normal. Ellie had mild conscious proprioceptive deficits in all limbs when evaluated at a later date. Ellie’s problems included significant cervical spinal pain, upper motor neuron disease with a lesion that localized to the cervical spine between C2-C6, myofascial pain in the cervical region, right thoracic limb lameness, myofascial pain in the thoracolumbar and cranial lumbar regions, bilateral stifle osteoarthritis and associated pain, soft tissue degeneration of the distal thoracic limbs, and decreased range of motion in the carpi and elbows bilaterally. The differential diagnoses for cervical spinal pain are fibrocartilaginous emboli (not likely due to length of time Ellie was painful), infectious disease such as Brucellosis, neoplasia of the spine or associated structures, a degenerative process such as Type II intervertebral disc disease, ingestion of a toxin causing ulceration of the esophagus (unlikely due to no history of this occurring), congenital malformation (such as hemivertebrae), autoimmune polyarthropathy, cervical spinal trauma from play with the housemate dog, or weakening of the soft tissue structures or immune system due to underlying hyperadrenocorticism leading to infection or degeneration of the spine. The differential diagnoses for right thoracic limb lameness are vasculitis of structures within the limb (unlikely due to a lack of visible or palpable lesions), Lyme disease (less likely due to low incidence in Washington State and no history of tick exposure), neoplasia of the bone or soft tissue of the limb, intervertebral disc disease causing nerve impingement affecting right thoracic limb, rodenticide toxicosis causing hemarthrosis (unlikely due to lack of history), developmental orthopedic disease of the shoulder or elbow, autoimmune polyarthropathy, trauma from falling down the stairs, or weakening of the soft tissue structures due to underlying hyperadrenocorticism leading to degeneration of the joints. The differential diagnoses for thoracolumbar and cranial lumbar pain are immune-mediated vasculitis (unlikely since this is not systemic), Lyme disease (again, unlikely), neoplasia, spondylosis, iatrogenic degeneration/injury of soft tissues from steroid treatment, soft tissue trauma from playing with the housemate dog, or weakening of the soft tissue structures due to hyperadrenocorticism. My putative diagnosis for Ellie’s cervical spinal pain is acute on chronic Type II intervertebral disc disease due to her signalment, abnormal gait, degree of neck pain, upper motor neuron signs, and conscious proprioceptive deficits. My putative diagnosis for right thoracic limb pain is nerve pain secondary to cervical Type II intervertebral disc disease. The chronicity of clinical signs and response to previous treatment with anti-inflammatories and pain medications also make this a more likely diagnosis that explains all of her active problems. In the absence of diagnostic imaging or other testing I cannot prove this diagnosis. If she had an autoimmune, infection, or toxic process I would expect her clinical signs to be more rapidly progressive and significantly exacerbated by steroid therapy. If she had hyperadrenocorticism I would also expect her to develop further clinical signs of that illness, including hair loss, further weakness, and persistent polyuria and polydipsia that did not resolve with discontinuation of steroid therapy. I grant that trauma from the housemate dog could have contributed to or exacerbated intervertebral disc disease. 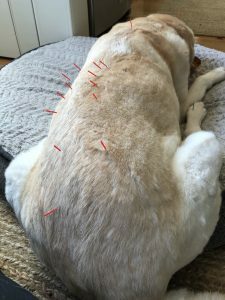 As Ellie had never received acupuncture treatment I initially started with dry needle acupuncture to determine her response to the process. I did not have access to a low level laser on the first treatment date. She tolerated the first treatment very well and I obtained a low level laser so further treatments were a combination of low level laser, dry needling, and electroacupuncture. I discussed massage techniques with the owner to loosen myofascial tension in affected areas in the early stages of treatment. In later stages of treatment, I added proprioception exercises such as low cavalletti and standing balance work, and strengthening of the pelvic limbs such as slow sit to stand work. I started treating her acute cervical pain with acupuncture, then low level laser therapy, and electroacupuncture. I moved to her thoracolumbar and lumbar spine and stifles due to compensatory strain patterns she had developed from her acute disease once her cervical and thoracic limb pain resolved. Initial treatment (using 0.16 x 30mm Seirin J type needles) consisted of GV20, GV14, and Bai Hui for their parasympathetic central neuromodulatory effects and vagal interactions to decrease pain and inflammation. GV14 also provided regional effects for cervical pain and inflammation, while Bai Hui provided region effects for compensatory pelvic limb pain and inflammation. BL10, BL12, and GB21 were chosen for their regional and local neuromodulatory and myofascial effects for Ellie’s cervical and inflammation. SI9 on the left was added for the strain patterns noted in the triceps for local myofascial effects. BL21, BL22, and BL23 were chosen to treat pain and myofascial trigger points in the cranial lumbar region. The owner was taught how to perform petrissage and effleurage to maintain myofascial release in regions where trigger points were present. Significant improvement in gait and comfort was noted within two days after treatment. Ellie had a relapse 5 days later. The owner took the pet to her regular veterinarian who prescribed steroid therapy, methocarbamol, and CBD oil. The second treatment was one week after the first and two days after Ellie’s relapse. It consisted of GV20, GV14, and Bai Hui for central neuromodulatory and regional effects as previously described, followed by BL10, BL11, BL12 for their regional sympathetic neuromodulatory effects (using 0.2 x 20 mm Seirin J type needles). SI3 (0.16 x 30 mm Seirin J type needles) was added as a peripheral point to aid in control of cervicothoracic pain and to alleviate the thoracic limb lameness. ST36 (0.16 x 30 mm Seirin J type needle) was placed for additional vagal nerve influence but was only placed on the left side as she was laying on the right side and would not cooperate to shift for right sided treatment. Needles (0.2 x 20 mm Seirin J type) were also placed in local unnamed cervical trigger points. 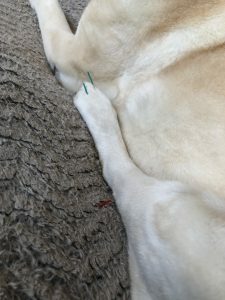 Electroacupuncture (Ito ES-130 Unit; 5.5 Hz) was applied from BL10 to BL11, bilaterally, but Ellie did not tolerate this longer than 3 minutes. After needles were removed, low level laser therapy was employed to treat the cervical region for a total of 10 minutes at 1 Watt using a variable wavelength low level laser (Multi Radiance 4 Super Pulsed Class 3 low level laser). The third treatment was 2 days later. In addition to treating her cervical region I added more caudal thoracic and lumbar points as she was tolerating dry needling very well. Points treated were GV20, GV14, Bai Hui, GB20, SI9, BL15, BL16, BL17, BL21, BL22, BL23, and BL25 (0.16 x 30 mm Seirin J type). During this treatment it was noted that Ellie was licking her lips less frequently and had increased lateral cervical flexion to the right. Due to Ellie’s improvement the decision was made to do weekly treatments. At the fourth treatment Ellie was very comfortable in her neck and was exhibiting more discomfort in her caudal thoracic and lumbar regions. Points treated at this visit were GV20, GV14, and GB20 to maintain cervical effects. Bai Hui, BL19, BL20, BL21, BL22, BL23, BL25 were treated for their central, autonomic, and local effects for the strain patterns and possible disc disease in these areas of her spine (Seirin 0.16 x 30 mm J type). LR2 (Seirin 0.15 x 15 mm) was added as a peripheral point to aid in proprioception and to see if she would tolerate needling at this location. 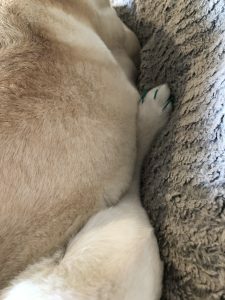 The final treatment showed Ellie to be very comfortable in her neck and forelimbs. Pain was evident in the thoracolumbar and lumbar spine and she exhibited pelvic limb weakness. Points treated were GV20, GV 14, BL11, and BL13 to maintain cervical and thoracic limb comfort. Bai Hui, BL19, BL20, BL21, BL22, BL23, BL25 were chosen for caudal thoracic and lumbar pain. BL40, BL60, and KI3 were chosen for stifle and tarsal pain, as well as their neuromodulatory effects through the tibial nerve (Seirin 0.20 x 30 mm J type). Bafeng points (Seirin 0.15 x 15 mm) were treated to increase proprioception. Electrostimulation was applied from BL19 to BL23 then BL23 to BL25 (2.5 Hz) for 5 minutes each segment. Low level laser therapy at 1 Watt for 5 minutes over each site was used to treat each stifle and the lumbar region. The owner was instructed to continue massage and physical therapy exercises to maintain and build strength in the patient’s pelvic limbs. Further acupuncture treatments could be carried out on an as needed basis. Ellie still showed signs of pain and decreased range of motion with convention treatment alone. The addition of acupuncture improved her cervical range of motion and pain control. She exhibited improvement with each acupuncture visit and this was not the case with traditional steroid and opioid therapy. I learned a lot from this case. It was interesting to see how, when Ellie’s neck pain improved, her caudal thoracic and lumbar pain was more evident. Her pelvic limb pain also became more prominent at that point. Geriatric medicine is treating the pet as a whole, not just the singular problem area. Retrospective study of the clinical effects of acupuncture on cervical neurological diseases in dogs. Liu CM, Chang FC, Lin CT. J Vet Sci 2016 Sep 30;17(3):337-45. 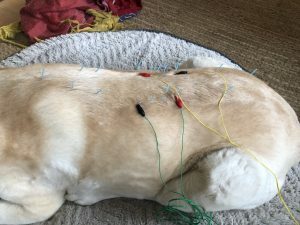 Evaluation of electroacupuncture treatment for thoracolumbar intervertebral disk disease in dogs. Hayashi AM, Matera JM, Fonseca Pinto AC. J Am Vet Med Assoc. 2007 Sep 15;231(6):913-8.